Chronic kidney disease is a global health-problem and various studies have shown that sero-positive status with human immunodefi­ciency virus (HIV) predisposes a person to various forms of renal disease ranging from acute renal failure to end-stage renal disease. , About 33.2 million people worldwide are in­fected with HIV,  which is associated with various renal lesions. HIV-associated nephro­pathy (HIVAN) has been the most common in the developed world. The renal complications of HIV in Africa and Nigeria remain poorly understood and hence form the essence of this study. HIV AN is a common form of renal di­sease that is rapidly progressive, making early diagnosis and treatment very important. Spe­cific clinical manifestations are suggestive, but renal biopsy findings are diagnostic. HIV-positive patients with evidence of renal disease and consenting to renal biopsy, and who were yet to commence anti-retroviral drugs, were recruited for the study. Enzyme-linked immunosorbent assay (ELISA) followed by confirmatory Western blot was used in tes­ting for HIV in the study patients. Renal biopsy was performed with an 18-gauge spring-loaded biopsy needle under ultra­sound guidance. The indications for the pro­cedure included proteinuria of 1+ and above and/or patients with glomerular filtration rate (GFR) less than 60 mL/min with normal sized kidneys on ultrasound scan. Staining of the biopsied material was carried out with hemato­xylin and eosin as well as special stains such as periodic acid Schiff and Masson trichome. The prepared slides were viewed under a light microscope. Approval of the ethics and research com­mittee of the University of Benin Teaching Hospital was obtained before commencing this study. A total of 17 patients were studied. Twelve patients (70.6%) had focal and segmental glo­merulosclerosis (FSGS) of the collapsing va­riant [Figure 1], two each (11.8%) had chronic pyelonephritis [Figure 2] and minimal change disease and one patient (5.9%) had membra­nous glomerulonephritis [Table 1]. 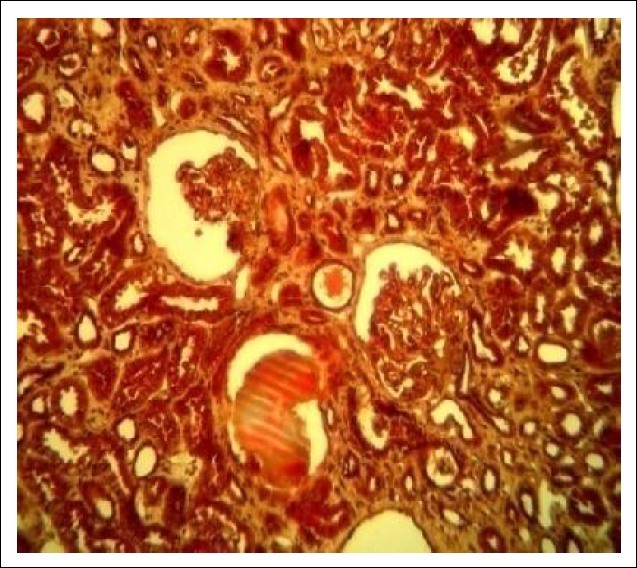 Figure 1: Renal histology showing features suggestive of the collapsing variety of focal and segmental glomerulosclerosis (Mason tricrome). 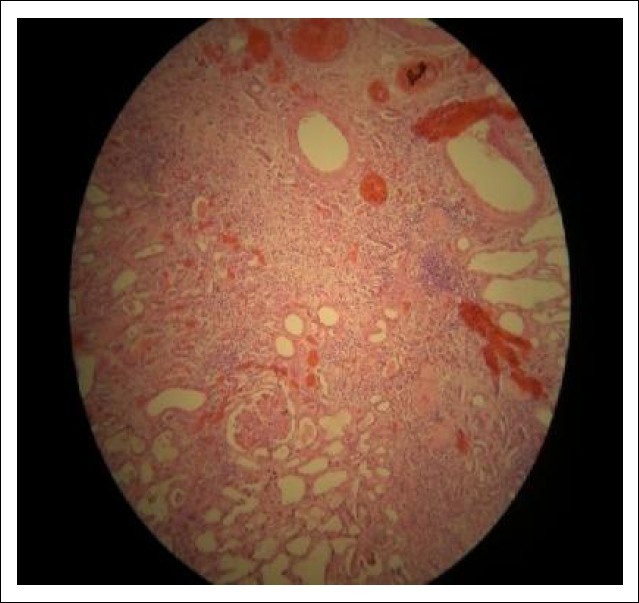 Figure 2: Renal histology showing features of chronic pyelonephritis (hematoxylin and eosin). Table 1: Renal histological pattern in human immunodeficiency virus-affected patients with renal disease. In our limited renal histopathological study of HIV patients with renal disease, the predo­minant histological type encountered was the collapsing variant of FSGS, a pattern which is in keeping with reports from other studies globally. 1. Seney FD Jr, Burns DK, Silva FG. Acquired immunodeficiency syndrome and the kidney. Am J Kidney Dis 1990;16:1-13. 2. Bourgoignie JJ, Meneses R, Ortiz C, Jaffe D, Pardo V. The clinical spectrum of renal disease associated with human immunodeficiency virus. Am J Kidney Dis 1987;12:131-7. 3. UNAIDS/WHO AIDS, epidemic update: December 2007. 4. Benin City, Nigeria, The Columbia Encyclo­pedia, Sixth Edition. 2006 Columbia Univer­sity Press. Retrieved February 18, 2007. 5. Oviasu E, Ugbodaga P. Evaluation of percuta­neous renal biopsy as a day case procedure: Experience from Nigeria. J Nephrol 1999;11: 246-8. 6. Szczech LN, Gupta SK, Habash R, et al. The clinical epidemiology and course of the spec­trum of renal diseases associated with HIV infection. Kidney Int 2004;66:145-52. 7. Agaba EI, Agaba PA, Sirisena ND, Antenyi EA, Idoko JA. Renal disease in AIDS patients in North Central Nigeria. Niger J Med 2003; 12:120-5. 8. Emem CP, Arogundade F, Sanusi A, delusola K, Wokoma F, Akinsola A. Renal Disease in HIV-Sero positive Patients in Nigeria: An Assessment of Prevalence, clinical features and risk factors. Nephrol Dial Transplant 2008;23: 741-6. 9. Szcsech LA, Grunfield C, Scherzer R, et al. Microalbuminuria in HIV infection. Vol. 2. Philadelphia: Lippincott Williams & Williams Inc.; 2007. p. 1002-9. 10. Gerntholtz TE, Goetsch SJ, Katz I. HIV-related nephropathy; a south African perspec­tive. Kidney Int 2006;69:1885-91. 11. Atta MG, Choi MJ, Longenecker JC, et al. Nephrotic range proteinuria and CD4 count as non invasive indicators of HIV - associated nephropathy. Am J Med 2005;118:1288. 12. World Health Organization. WHO case definitions of HIV for surveillance and revised clinical staging and immunological classification of HIV related disease in adults and children. 2007.